After around eight years years of French classes, I have learned a good deal about Louisiana’s French history. We focused on the Arcadians, so my knowledge of Louisiana history is very specific. However, I wanted learn more and refresh that which I have already learned. I had always wanted to visit Louisiana, and though I had never had the chance, my parents told me wonderful things about New Orleans when I was young. I had never heard of the term “bookpacking” before my advisor suggested this course to me, but I loved the idea. When I was a Senior in high school, I spent my last months partaking in “Senior Project.” For my project, I wrote a book, or part of one anyway; I wasn’t able to finish as we only had six weeks. I fancied coffee shops for writing most of the time, but I also played around with immersion. I loved writing from places similar to those in which the story took place at that moment. It made it so much easier to lose myself in the story. I wondered if reading a book in the place it was set would have a similar effect. I was most eager to read Interview With The Vampire, due to a love of the supernatural, but I was excited for every book on the list. I was happy to have never had the chance to read most of these novels. This way I could experience them for the first time fully immersed in the settings in which they take place. I was hopeful that this would be a fun and rewarding experience. The Awakening served as my introduction to “bookpacking.” Though I had read it before, and therefore did not have the same experience to speak of as the others, it was still remarkable reading the novella in the place it is set. 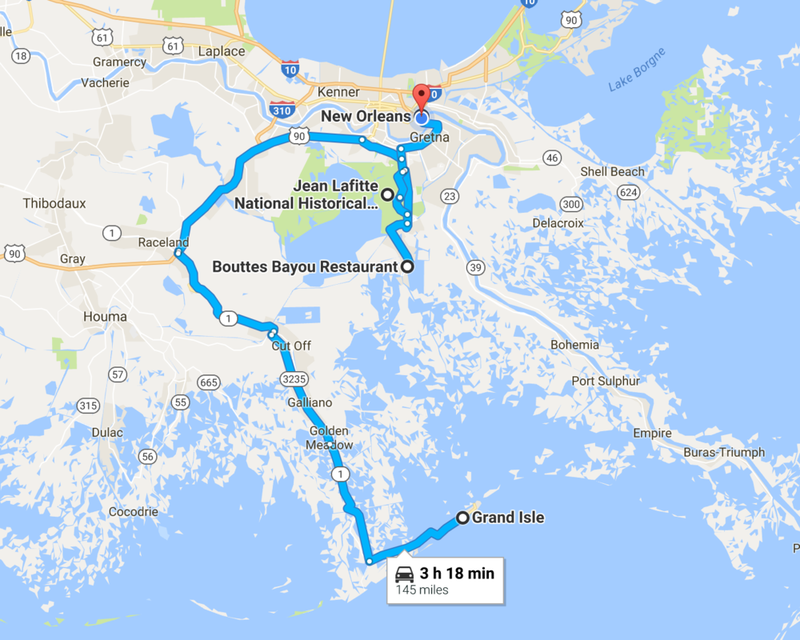 I had a different idea of Grand Isle, as well as Louisiana in its entirety, before we drove down to the popular vacation destination. I had never given too much thought to what Louisiana looked like before this trip, though I had learned a bit about its French history in high school. I merely knew that it was heavily covered in marshlands and swamps, and that it had been devastated by Hurricane Katrina a little over ten years prior to our visit. These were not things that I took into mind when first reading Chopin’s novel, and imagining the island where it takes place. I first read the book to analyze it, not to understand the place or the culture. Therefore why I did not pay as close attention to the setting description and cultural norms. While such mentions seem a prominent part of the character development and understanding of the book now, it was not until I was in the place where the novella is set that I grasped just how much a four-dimensional setting can change someones perspective of two-dimensional piece of art. When we arrived in Grand Isle I saw very minimal businesses, restaurants, and shops. I expected the island to be bigger, both in land mass as well as in grandeur. I believed the houses would be bigger and more commercial than the locally owned ones that we saw as we drove to our rental. I expected there to be people roaming about on the main road, and out in the ocean, relaxing on the hot sand. Yet, we were met with empty roads, a quiet ocean, and a deserted beach. When my idea of the place was not met, I became excited about reading Chopin again. I wondered how I could have imagined something so different than the place she was describing. As I read on the beach, and in the rocking chairs in front of the window looking out at the shoreline, I began to realize the description was accurate in so many ways, but I needed to see it for myself to understand what Chopin was attempting to capture. From there I was even more eager to read the novella than before. The characters became more real. Even though we are living in a much different time period, I felt like I could have been in the story. Not only did the fact that we were in the setting of the piece help, but our location itself aided in this feeling. Grand Isle has this magical aspect of isolation that I’m sure is why people have gone there to vacation for so long. In our rented house, reading and relaxing, and living our lives, we were so far removed from society that it was almost like we had fallen back in time. Grand Isle was such a great way to begin the course and a perfect start to the "bookpacking" experience. We finished reading the book before heading to New Orleans, but the part of the story which takes place in the famous city excited me to read, learn, and experience more. I as said before, I was most excited to read this novel. As one of the more recent works we would read, I did not fear a barrier in dialect or custom. I was a bit mistaken. The story begins present day, only to flashback to the late 18th century as Louis tells his story, which then goes on to span a great deal of time and cultures to end in present day where the interview is taking place. It proved much more difficult to immerse myself in this narrative. There were many reasons for this. The first being the aforementioned time and cultural difference. I found it much simpler to imagine Edna and late 19th century Grand Isle because of the isolation of the island. It was easier to lose myself in The Awakening and imagine the place and characters as they were in that time because I was surrounded by an unpopulated vacation town. There I could see what I wanted and needed without interference, whereas in New Orleans my imagination was hindered by the heavy tourism of the city. It also helped that The Awakening is more rooted in reality than Interview with the Vampire. It is funny that what I most anticipated about Rice’s famous novel is what impeded my immersion the most. I was excited for the supernatural story that Louisiana is such a perfect setting for. The vampire fiction was both extremely enticing, and at the same time annoying. I loved reading the book, and I especially liked how Louisiana is an ideal place to set a supernatural fiction, specifically New Orleans, and especially vampire literature. Wandering around the city and seeing the places described in the novel as they are today was extremely gratifying. I do not think that any of the other books we read gave me more reference of important places in New Orleans than Interview with the Vampire. However, while I found it helping in exploring the city, I did not find it was as helpful as the other novels in exploring the culture. That is not to say that it was not helpful in understanding the culture at all. There was one aspect of Louisiana culture that Anne Rice hit on the button more than any of the other authors: “french-ness.” In a place where being a Creole could be equated to having been of noble birth, this is a very important aspect of the culture. Themes of “french-ness” in this book include: sensuality, sexuality, relaxation, (over)indulgence, lavish lifestyle, and parading wealth. These themes still endure in various amounts, both in Louisiana culture and in French culture, though they were definitely more prominent a few centuries ago. One other aspect of Louisiana culture that the other books did not touch upon is the Voodoo religion. Not much is said about Voodoo in Interview with the Vampire, but Louis recognizes that his slaves were the first to notice his change and possibility of his supernatural nature. This would be due to their knowledge of spirits and demons through the religion of Voodoo. While Voodoo is not explicitly detailed in any of the books, we had the opportunity to visit the New Orleans Historic Voodoo Museum. There we learned of the Voodoo queen, Marie Laveau, who’s grave we later visited in St. Louis Cemetery 1. I found it difficult to immerse myself in this book due to my lack of enjoyment and the cynical and pessimistic musings of the main character, Binx Bolling. This novel was by far the least favorable of the lot, in my opinion, which is likely why I struggled in using the novel to explore the culture and terrain of New Orleans. However, even though I was not the biggest fan of this novel, I do believe it helped me to understand New Orleans better than I had previously. This appreciation was gained after finishing the novel and seeing those places that Binx had described. Binx’s Aunt Emily lives in the Garden District, a place which he was determined to distance himself from. This is evident in everything that he does, though his roundabout way of traveling to his Aunt Emily’s in the beginning of the book, is a good example of the lengths he is willing to go to achieve this distance. The differences between Binx and his Aunt’s personalities and priorities parallel the differences in their respective neighborhoods. This connection allowed me to put a story to the places I was visiting, which in turn made the experience that much more enticing and intimate. Through the characters residing in each section of the city, I felt I was able to see the personalities of both of the neighborhoods. The Garden District is the section of New Orleans where the wealthy reside, specifically those of high class and old money. Binx describes the Garden District as having a “genteel charm.” In one instance where he is traveling on Elysian Fields Avenue towards the Garden District from his home in Gentilly and seeing swimming pools and manicured lawns, he knows that he is getting closer by the increasing wealth displayed in the homes. 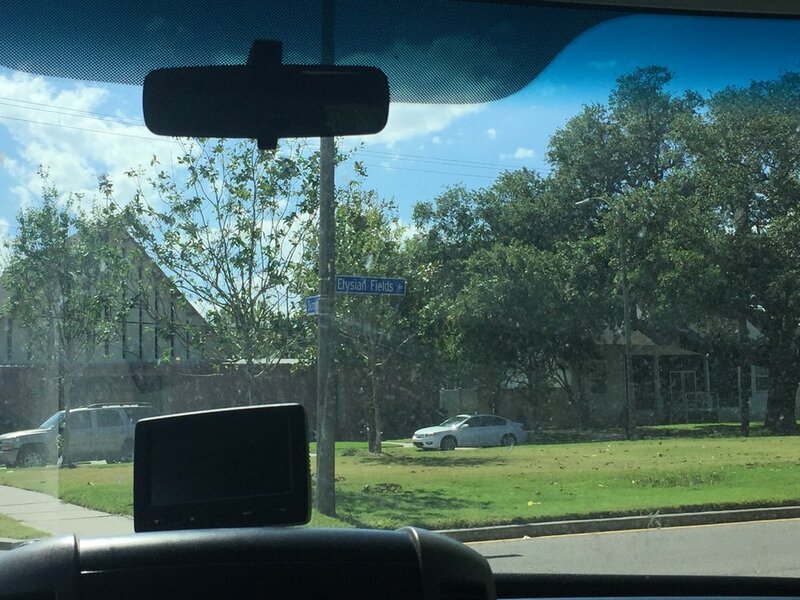 Though we travelled to the Garden District by way of the St. Charles Streetcar from the business district, I was still able to see for myself the difference of the homes in the Garden District to others seen along the way. I understood the just of it; that one can tell that they have arrived as soon as they have entered the Garden District. Fortunately we had the opportunity to explore over there on numerous occasions. I don't remember seeing any swimming pools, but I can attest that the houses are truly stunning. Binx describes Gentilly as a middle-class suburb of New Orleans, and that, save from a few details of the place, one would never know it was a part of New Orleans. He describes life there as being peaceful, and I cannot say from what I have seen that that is not true. I liked seeing this place in which Binx Bolling lived his life. Fiction, I know, but still interesting. It was also interesting to visit Lake Pontchartrain which is mentioned a few times in the book. The northern parts of New Orleans were not really mentioned in the other novels, so it was nice to have this book to reference in that aspect. Because we read A Confederacy of Dunces before arriving in New Orleans, the bookpacking experience varied. 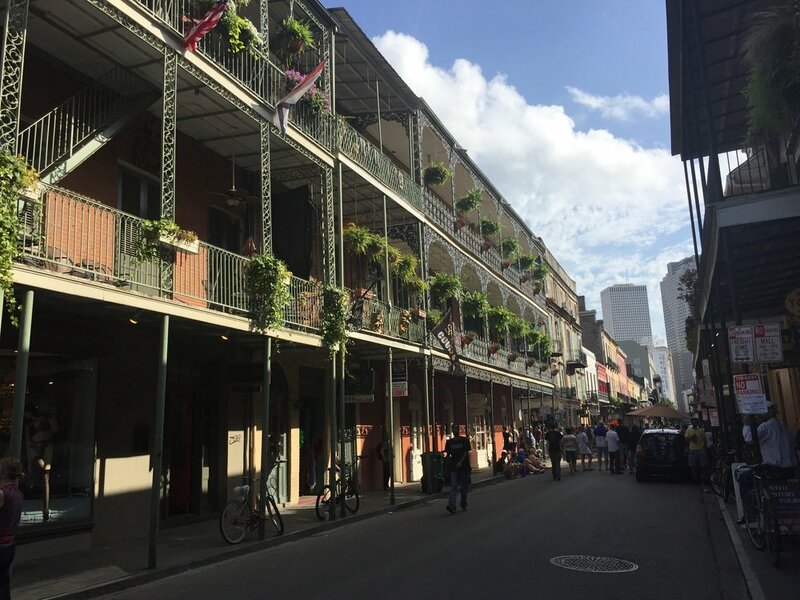 Like with The Awakening, I had a different idea of New Orleans than what I ended up experiencing, though unlike The Awakening, I did not have the pleasure of reading the book again in the place it was set. I was expecting much more of Bourbon Street than I saw, though I can’t complain seeing as I only visited during daylight. If there is one thing I especially want to see if I return to New Orleans, it would be Bourbon Street at night. Canal Street turned out to be bustling, and very touristy, so it was easy for me to imagine Ignatius strolling along. We even went to the statue of him in front of what was the D.H Holmes Department store, and what is now the Hyatt French Quarter Hotel. The statue was sculpted with the opening scene of the novel in mind. At this point I could definitely see Ignatius on Canal St.
For the most part what I gained from A Confederacy of Dunces was just a hilarious read, but it was also interesting in regards to the dialect. The speech was something that I was not accustomed to when we arrived. I was expecting deep south accents and great manners, not much more, when I was accepted to the course and thought about Louisiana. Then again I hadn’t had much experience with southern dialects before. I had only been to Florida and Georgia prior to this, and I am not quite sure that Florida would be considered southern by way of culture and speech. Though I think that Toole exaggerated, as he did with everything in this novel, it was nice to have some heads up at the difference in speech before we arrived. For the most part I met people who had accents, but whose speech otherwise was similar to that which I was used to. There were some people who did speak like Toole’s characters in A Confederacy of Dunces, and it was jarring at first, both in the book and in reality, but over time it became just another Louisiana quirk to me. 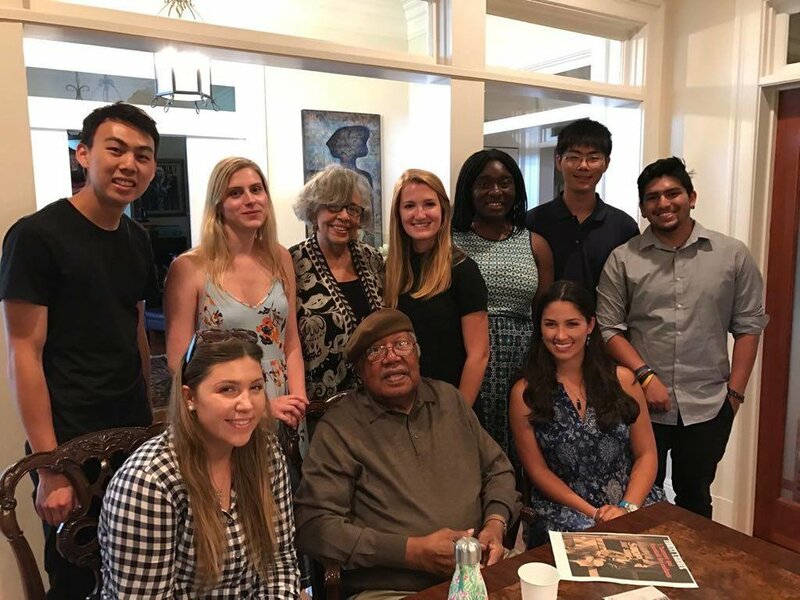 One of the best, if not the best, and most rememberable experiences I had on this trip was meeting Ernest J. Gaines himself. The man is a living legend, and to be in his presence, talking about his most famous work, was nothing short of amazing. His wife and daughter showed us around their property including the church that Ernest was schooled in during his childhood, and which they are now restoring. While we gathered around the table to talk to Ernest, Mrs. Gaines brought us lemonade and cookies. Such a kind gesture was much appreciated, especially because they had already been so kind as to indulge our visit. 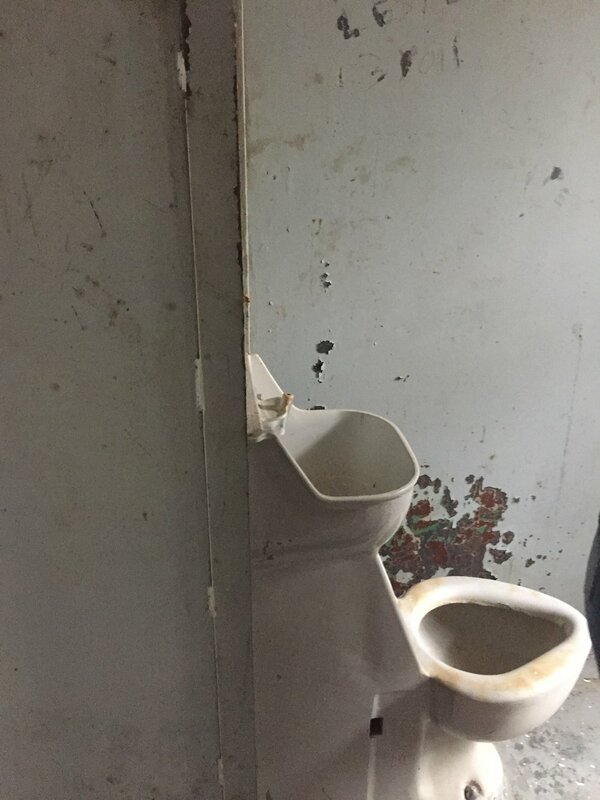 A true measure of Southern hospitality. I found myself so nervous sitting next to Mr. Gaines at the table as we discussed his work. I knew instinctively that this man was wise beyond my years, possibly wiser than I will ever be. Definitely the highlight of this trip. The most interesting part about bookpacking with A Lesson Before Dying, besides discussing the book with Ernest J. Gaines himself, was visiting the prison and courthouse where Jefferson’s trial and incarceration were set. What was especially fascinating was when the staff at the police station accompanied us to the old prison cells. The retired cells, which are not open to the public, are on the top level of the building. 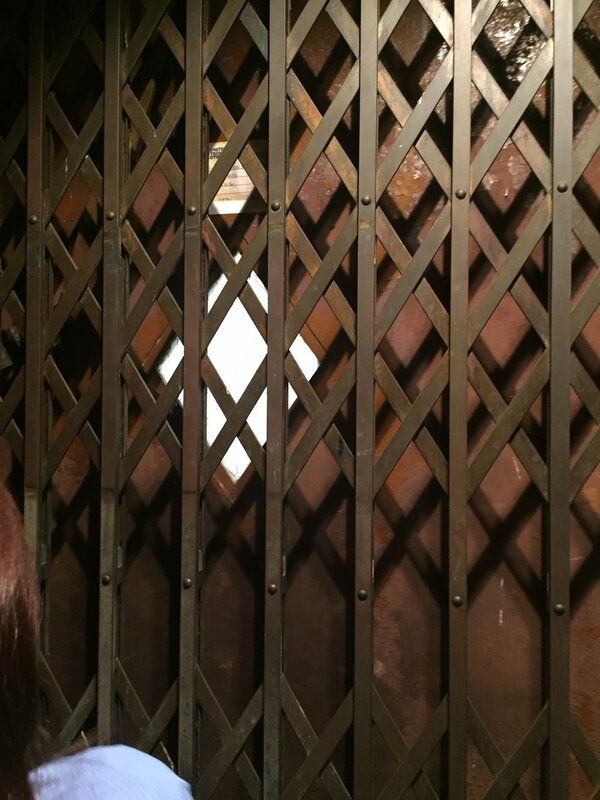 There is a set of stairs that Gaines writes about from Jefferson’s perspective. While we counted and the number was off, the sentiment was there. We ended up taking the creaky. small, old elevator up the one floor to the cells. There the women told us the history and layout of the prison cells, which the use of was discontinued in the 80s if I am remembering correctly. Weaving in and around the different rooms, seeing the bunks, the toilets, the one solitary cell, I felt I had a more real vision of Jefferson. Talking to Gaines prior to visiting the prison he told us he was inspired by the real story if Willie Francis. After learning this, the story became more rooted in reality, and the effects of reading it hit harder than before. This short tale based in Cajun country was the epitome of what "bookpacking" should be. I read the story sitting on my bunk in our rented house in Lafayette after visiting Tom’s Fiddle and Bow. The characters in the story seemed so real, like I had just met the lot of them earlier that day. Tim Gautreaux wrote from each character’s perspective, and that made it even more interesting to read. I felt I shared Floyd’s determination to get his daughter back, and that I was rooting him on from the sidelines, willing to help out like his neighbors. Community is well depicted here. Everyone knows the other. Floyd mentions music, which we had spent most of our day preceding my reading this story listening to. 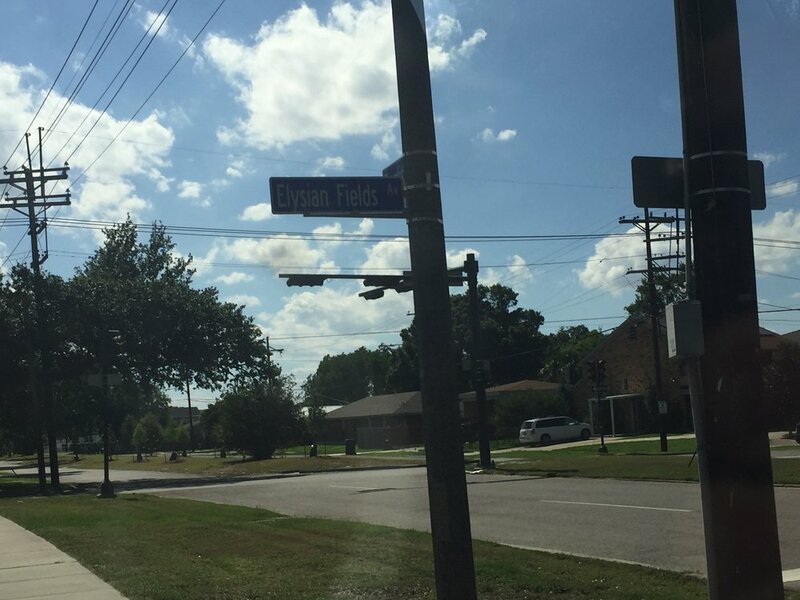 Music is an important aspect of culture, as I was constantly reminded during my stay in Louisiana. Religion is a priority. Floyd spends most of his money on his daughter’s clothes, schooling, and cultural education. He also references his ex-wife as a "LeBlanc gone mad," noting that she stays out all night, drinks beer, smokes dope, and has given up French music and rock and rock for country. Though I don't necessarily agree on that last one, I find it interesting that that is how Floyd chose to describe that his ex-wife had "gone bad": a change in music taste. The description of the setting fit with what I could see out my window each time we ventured out of our rental. But that was just the setting, the real magic of "bookpacking" with this story was the parallels that I could see between the characters and the people I had met previous to reading it. 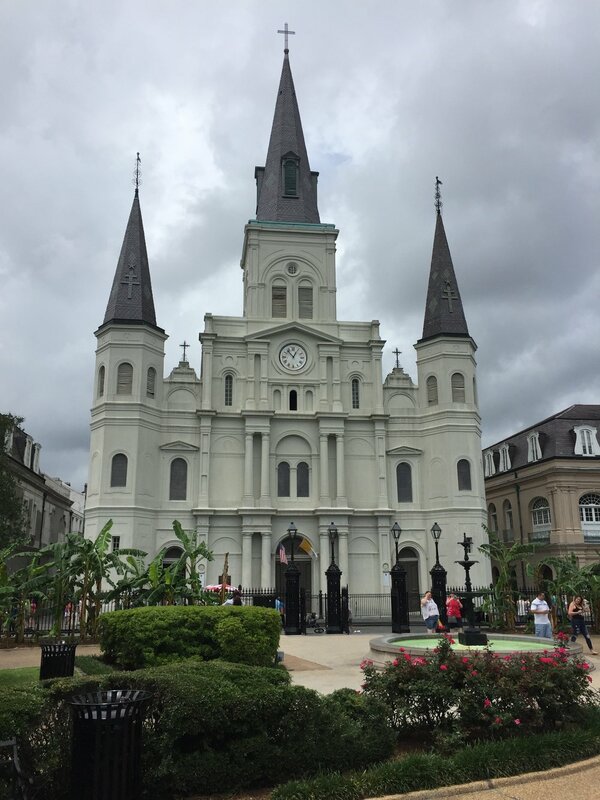 Though I believe Anne Rice captured the “french-ness” of New Orleans in all of its grandeur, I also think that most of the books have those cultural French aspects in them, especially those set in New Orleans. Sexuality and leisure play a big part in The Awakening as well as The Moviegoer. Ostentatious behavior and nightlife are prominent in A Confederacy of Dunces. Finally, wealth, and the politics that accompany that wealth, is a big theme in All the King’s Men. The use of French language in Floyd’s Girl. French aspects in these books are not limited to what I have listed, and I could go on, but those are the aspects of the books that most stood out to me. 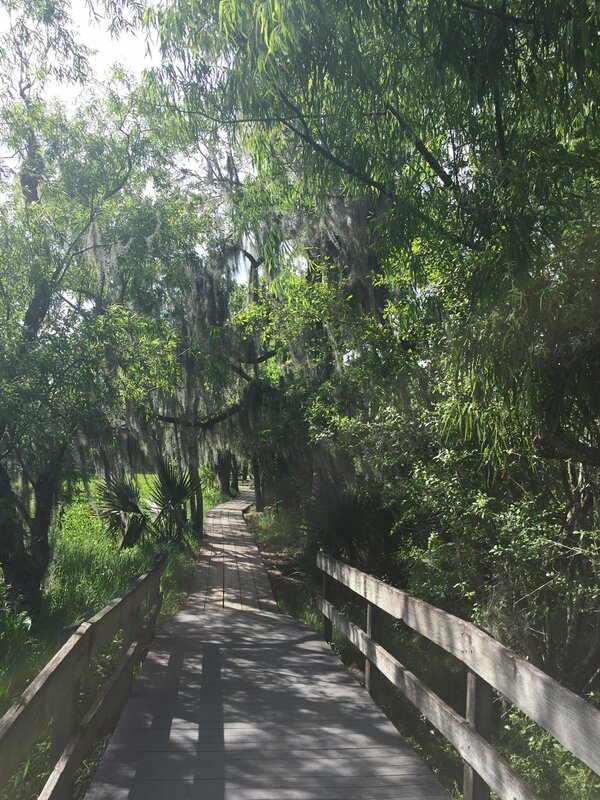 You may have noticed from my poems about the different music I encountered on our trips and in each text, that music has been a focal point of my experience traveling Louisiana. What I have most noticed in every book is how art culture, not only music, plays an important part in each narrative of at least one character. From Mademoiselle Riesz's piano and Edna's painting, to Binx and his moviegoing, even Jefferson's writing. In some form or another, art has a way of not only telling a story, but allowing a story to progress, and further pushing it forwards, when it is included in a narrative. Read the edge of the bottom roof: "I'm not sure but I'm almost positive that all music came from New Orleans"
I love the idea of ‘bookpacking,” and when it works, it works. It is a hard idea to peg down because you have to have the right book to be able to immerse yourself in the culture. An enjoyable book that is rooted in reality, rich with the culture of the place and in descriptions of the places where it is set. It is hard to remember that you are reading to enhance your view of the place and its culture, not just for the enjoyment of the book. Especially with this course, I found it difficult to not analyze each novel as I read, like I would in a general English course. I had to remind myself that this was not a typical English course like those I had taken, but a mixture of English, History, Sociology, Journalism, and maybe even a few more. I definitely think that I gained much knowledge of Louisiana culture from our visit and the books we read that I would have otherwise not had I merely been vacationing in New Orleans for the same amount of time. I will definitely continue to employ "bookpacking" during future trips, though likely not on the same scale. I hope by reading my blog you will have been inspired to do the same. If there is one thing I will forever remember about Louisiana, New Orleans in particular, it's the food. If you haven't been yet, you wouldn't, couldn't, understand. It's not just the beignets, though those magical treat would be enough for me. It's all of it. The beignets, the ice cream, the gumbo, the po'boys, the crawfish, the catfish. I could go on, but I wont, because then you would never make it through this blog. Or you would and you would hate me because then you would need to book a ticket to Louisiana just for the food. I'm still running that risk by posting that, but I'm okay with that choice. Here are some of my favorites from the trip (and I'll tell you where they are in case you buy that ticket). So good. I can't describe to you the joy of eating a beignet from this place. Would definitely return to New Orleans just for these babies. 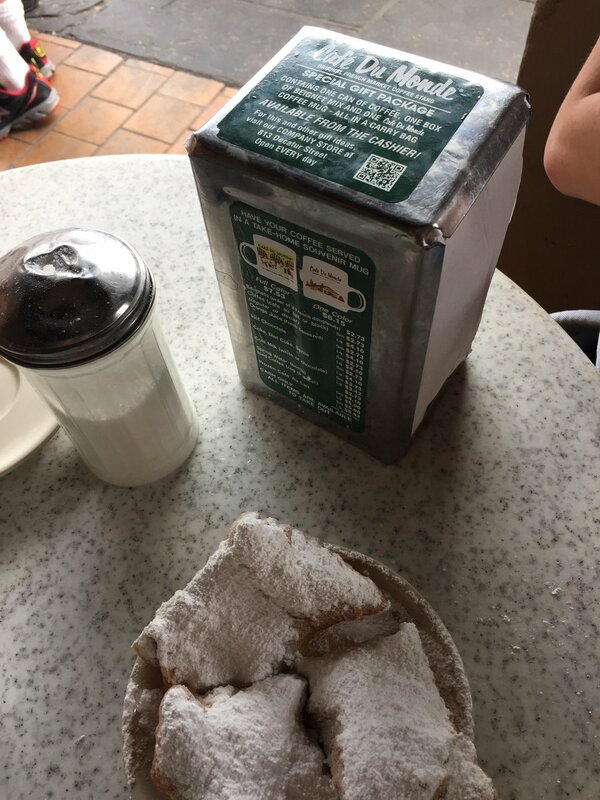 Find Cafe du Monde across from Jackson Square. We're back! Yeah, we came back a few times. Who could blame us? The beignets are 3 to an order for only $3!!! Plus the coffee is not bad either. Seriously it would be a sin not to try one of these. At this point, Bowen has tried to marry Morgan and her beignet, which she couldn't resist and just had to eat. Powdered sugar got over everything. It was hilarious. Guys, food like this creates good stories, so head out for a beignet. No joke though, leave now. A Cuban sandwich shop in the French Quarter not too far from Cafe du Monde. The sandwiches are super tasty and the decor is a writers dream. Filled with Hemingway quotes and pictures, and with a cozy alcove up the stairs, this place is a great place to study or read and have a bit of lunch. Coffee poured over ice cream, ice cream melting under hot coffee. Enough said. Yes, this is a snapchat, yes it is poor quality, but forget that. Focus on the ice cream. We went back a few times. I realize that I can make coffee to pour over my own ice cream, but the ice cream here was just so good. It was also near our hotel, so that didn't hurt. 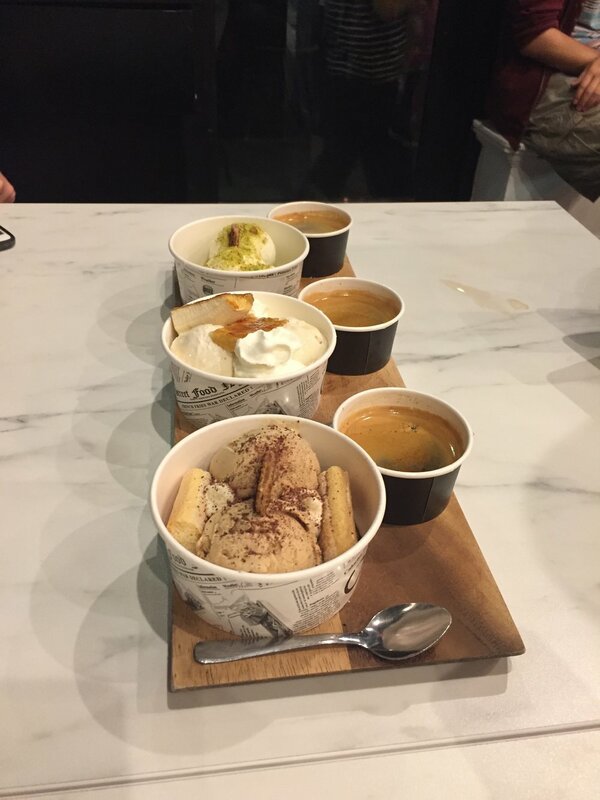 Find the Drip Affogato Bar at the corner of Carondelet St. and Girod St. in the Business District. We came here a few times, though I didn't realize the sign on the outside of the shop said McKenzie's until the third trip. Not sure how that fits in, but I can assure you that the creamery has some great ice cream. They have the classics as well as a never ending list of special ice creams they are trying out. There are so many to choose from that you might be there all night. Find the Creole Creamery in the Garden District, riverside of the St. Charles streetcar. Not only is the ice cream really tasty, but it's also super pretty to look at. This was our last time at the creamery, and I can't help but think it was because Bowen could not face the place again. On this last visit, Bowen decided to take on the Tchoupitoulas Challenge. 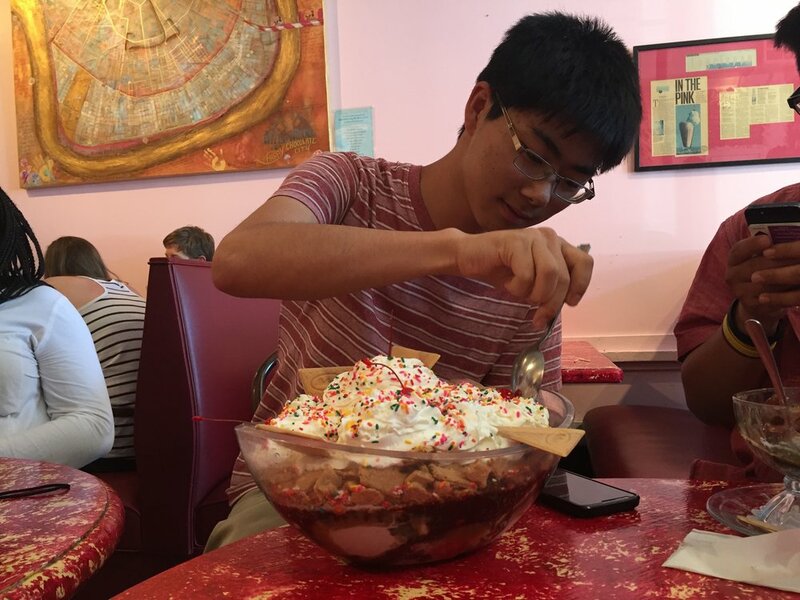 8 scoops of ice cream, 8 toppings, and a can of whipped cream, all to be consumed in one sitting. He was hopeful, but in the end the bowl was too big and his stomach to small. He said he would do it though, and he followed through, so I give him props for that. A little bit pricey, but a lot a bit worth it. Another place we went back to a few times. We just couldn't get enough of that mac and cheese. Crawfish, mushroom, regular, they are all so good! You can find Salon above the Sucré sweet shop near Jackson Square and the St. Louis Catherdral. Makes sense since the food is heavenly. An up close look at the mushroom mac and cheese. 10/10 recommend. I don't have a picture of the dessert we got from the sweet shop below where we had lunch, but I can tell you that the gelato is great. They also have a lot of really cool pastries to choose from. On to yet another favorite - Golden Chips. 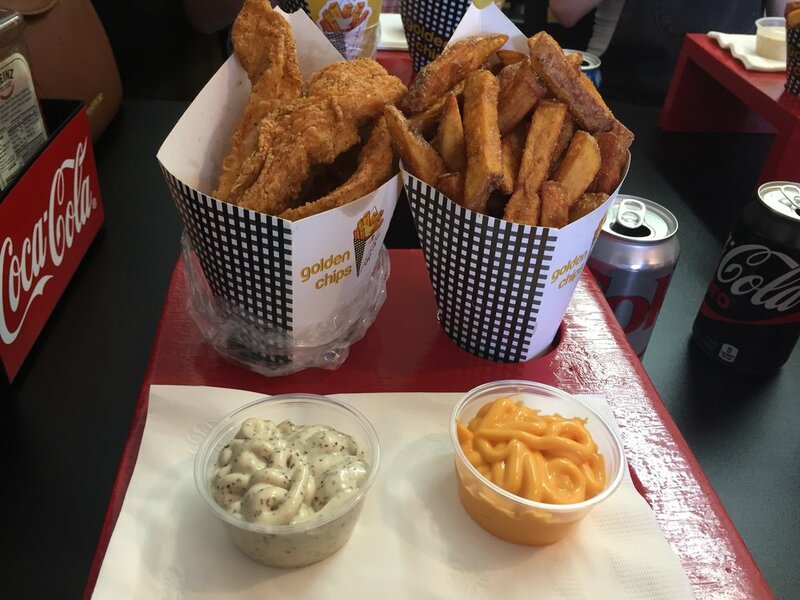 Here you can find some of the best french fries and some bomb chicken tenders. Yes, I do realize I just said bomb, but it was warranted. They serve you the fries and tenders in cones which they put in these really cool trays. Needless to say I'm in love with this place. You can find this delicious treat on a side street near Jackson Square, but may I suggest you use maps since it's a bit tricky to find. If you don't want to stay in the shop to eat, and you may not want to since it is small and gets pretty smokey when they are cooking, you can take your food to go. May I suggest Jackson Square. That is where we took our food, and it was really nice. Golden Chips To Go Cont. Pro tip: if you do end up taking your food to Jackson Square, sit on the benches to eat. We found that the cones fit perfectly in the lattices. But don't feed the birds, they will swarm you. Louisiana is a home for fried food, and while I love it, and I am not complaining, my stomach was not so much obliged. We felt like we needed something healthy after two weeks of fried catfish and crawfish and po'poys. So, we found this health food place called the Daily Beet near Lafayette Square on Girod St. They have some really good smoothies, salads, bowls, and my personal favorite: avocado toast. During our stay in Lafayette, LA we attended a potluck and jam session at Tom's Fiddle & Bow. There we were fortunate enough to listen to not only historic deep south songs, but also popular bluegrass country songs. The people there were not only extremely kind, but also very talented, and they brought great food to boot! This potluck jam was a higlight of my time in Cajun country. to introduce their bluegrass sound. they play to a Cajun country crowd. to a good 'ol Cajun country song. It was getting late, now time to go. In our goodbye there was much woe. the magic of a Cajun country show. Jazz - the music of New Orleans. It's smooth, it's slippery, it's so unique to the history of this city. Some say that the name comes from the jasmine perfume worn by the women of Storyville, where this music originated. If you are ever in New Orleans, stop by Preservation Hall for a short concert, but get there early because the line gets long quick. The liquid courage you drink. 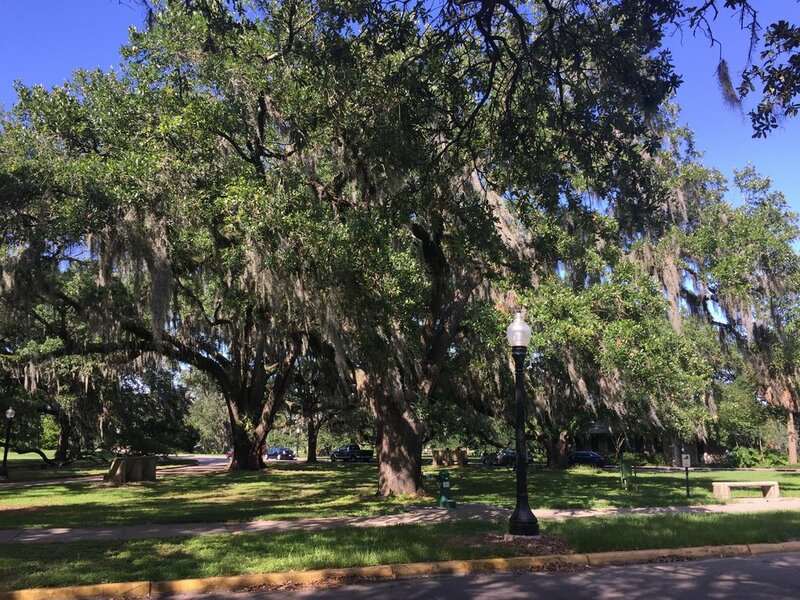 Anne Rice chose the perfect setting for her novel Interview with the Vampire. Not only do the southern parts of the United States provide a rich history, but they also showcase weather and natural disasters that bring with them a lingering feeling that danger is on the horizon. This provides the perfect atmosphere for a supernatural narrative, especially literature focusing on vampires. However, while the south is ideal with it’s history and geographical features, the culture is what makes Louisiana specifically perfect for this novel. Louisiana is essentially an extension of the French culture, and aspects of “French-ness” can be found all over the state, though especially in New Orleans. Sensuality and sexuality, nightlife, overindulgence, and extravagance; the aspects of French culture that coincide with common themes of vampirism, and what made Louisiana the perfect choice for the setting of this novel. History is the first thing that comes to mind when I think of all of the ways Louisiana is creepy. With slavery and the Civil War, both which brought a lot of death, likely baring restless and vengeful souls, you could imagine that every inch of this state is haunted. If not death from these two causes, then likely from disease. Claudia's mother in Interview with the Vampire had died of Yellow Fever when Louis found them. Then in more recent history, there have been multiple hurricanes, the biggest and most famous being Hurricane Katrina. With these many death bearing situations, it seems to me that there is a strong likelihood of haunting in Louisiana. History is important in breathing life into the supernatural. Ideas of otherworldly creatures don't just appear without provocation from somewhere. As if this idea was not already pounded into my brain, it would be. The first thing we were met with upon arriving in New Orleans was a protest against the removal of the statue of Gen. Robert E. Lee from his pedestal in Lee Circle. The nature of Louisiana alone is enough to make it the perfect setting for a vampire fiction, or any supernatural fiction really. The humidity that breaks down wood buildings over time, decaying houses across the state. The overgrowth of foliage, that makes it seem almost as if the greenery in Louisiana is alive, and with a mind of its own to overtake the man-made structures that have been imposed on its land. The Spanish moss is beautiful, though eerily so. The wrought iron railings in the French Quarter, and the fences in the Garden District, that also look as if they are alive. Twisting and turning creepily when casting shadows, and tall and imposing to keep those unwanted out. Then there is the prominence of the Catholic religion and the raised cemeteries, but we'll get to that later. 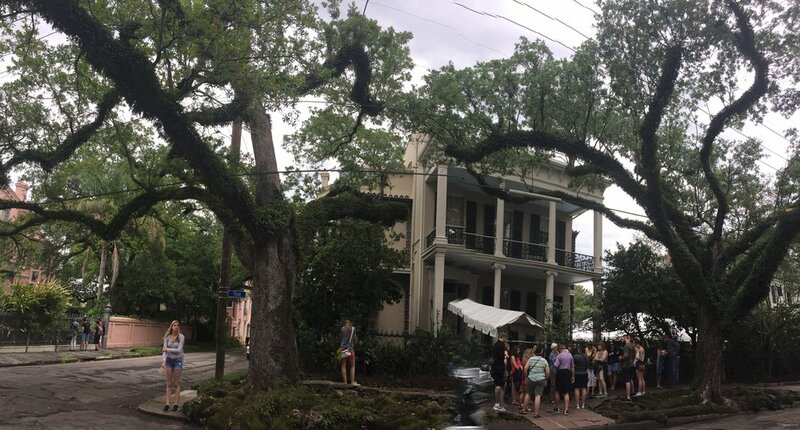 The Anne Rice house (second row, first picture) is a great example of the animated foliage. 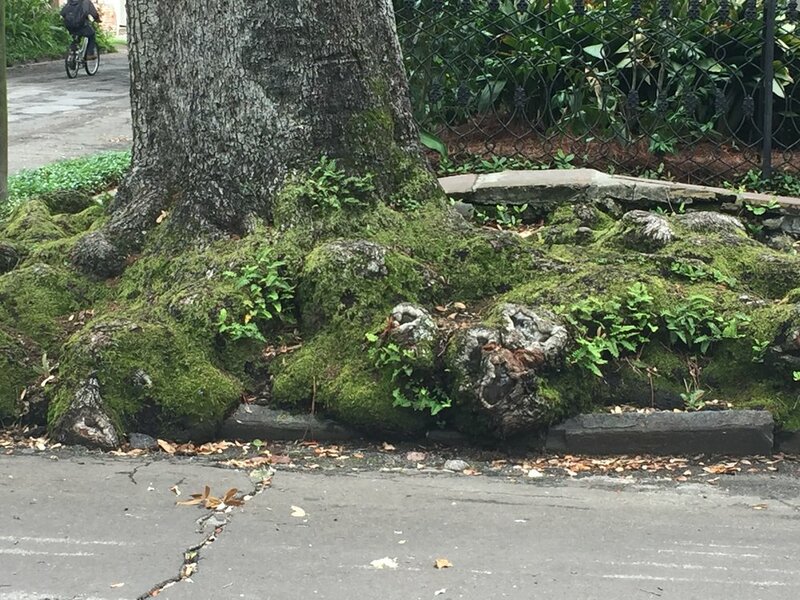 The trees look like they are moving, coming out to grab you, and the roots are eating away at the curb and the brick sidewalk, spilling out into the street. 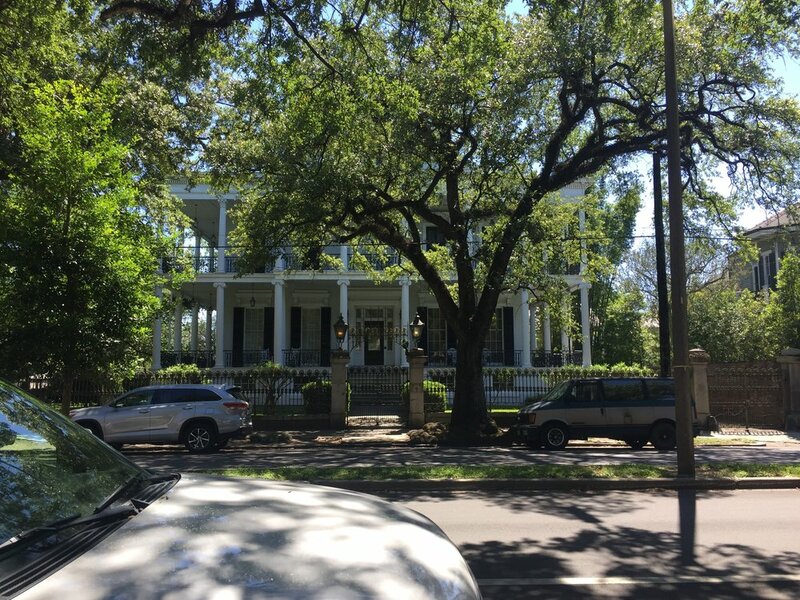 The American Horror Story: Coven house (first row, last two pictures) is only a few blocks away from Rice's previous home, and it is so beautiful, but at the same time you can imagine that it might be haunted. Like most things, vampire folklore has evolved over time. In the ancient times there were demons: creatures of darkness, fallen angels by the Christian belief, that would possess members of the community and reek havoc. Though this idea of demonic possession still floats around in certain religious societies, it has also branched off and evolved into the creation of another demonic creature: the vampire. The folklore and religion that gave breath to this “creature of the night” is heavily rooted in European culture, so it is understandable that the further into the future and more westernized this idea becomes, the European roots will live on in modern depictions. As Louisiana was an extension of French culture in the new world, it makes sense that if these creatures were to travel across the Atlantic Ocean, they would end in this part of America. If you have ever been in an old European Catholic church, you would know that they are not shy whatsoever about death. In fact, the crucifixion scene is popular to display in entryways, and over altars. Some show the nails in Christ's hands and feet and then a little blood. Others go all out. I'm talking horror style gore, the visions of nightmares, namely mine as a child. Louisiana has a similar openness about death, though they show it in a different way. The cemeteries of Louisiana are so prominent, you could not miss them if you tried. They are above ground due to the geographical problems that Louisiana poses; wood floats, so when the land floods, well you could imagine the problems. All over the state, the inhabitants of Louisiana are not shy or squeamish about death at all. In fact, graveyards are across the city, some bodies were never moved when the city grew and the cemeteries downsized and moved. The gas station next to St. Louis 1 cemetery found a few surprises when they were laying their foundation. We even spotted a cemetery next to a playground in Grand Isle. No only is this openness about death, and borderline showcasing of it, provoke stories of the undead to be told, these 'cities of the dead" provide such a great setting for vampire fiction. 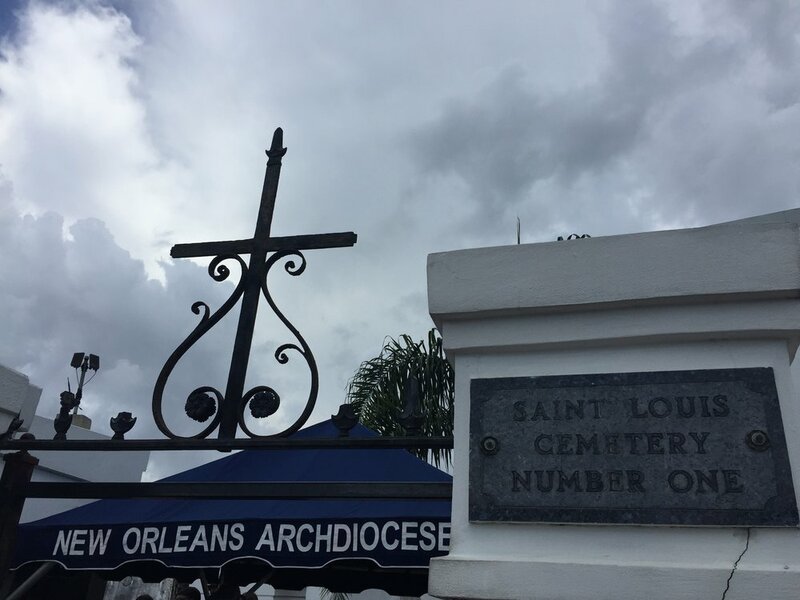 We toured the St. Louis Cemetery Number 1, where Louis's brother was buried, the St. Louis Cathedral, and an Ursuline convent. We even visited the Lafayette No. 1 cemetery where Claudia hunted in Interview with the Vampire. Nature played a part their as well in adding to the already eerie quality of an old cemetery; vines crept in, through, and around some of the tombs, cracking a few. Some graves were even open. Due to the city’s origins, there is a certain “French-ness” associated with the state of Louisiana. The Creole citizens in New Orleans especially fit this mold, and specifically the French Quarter. There are certain aspects of French culture that fit so well with the classic example of vampires. One of these aspects is living a dramatic and lavish lifestyle. The French reputation for being extravagant and dramatic people, parading what wealth they have to impress their neighbors. This was not lost among the people of Louisiana, especially Louis’s family and those plantation owners at the time the book is set who had come from France and been granted land to settle indigo plantations. They came over with luxuries not yet available in the “new world,” and continued accumulating furniture and other material objects to showcase their riches. Wealth has been a long-standing measure of importance in society, and it was no different during this time in Louisiana. Louis is not the foremost example of this extravagance, but his mother and sister are, and his wealth is what draws Lestat to him. Lestat, contrary to Louis, loves the drama of being a vampire and he wants to live a life of luxury. Louis is the means by which Lestat and Claudia live as lavishly as they like. The wrought iron railings on the apartments in the French Quarter never cease to amaze. Though the places above are not quite what I imagine Louis, Lestat, and Claudia living in, there is the idea. It is extravagant, and so beautiful. Though Lestat is the driving force behind the extravagance of their new place, and although he knows that he does not need any of what he has, Louis still enjoys it. Vampire’s have so long to live, and since the people surrounding them are nothing but vehicles of blood for them to feast on, each of which will one day expire, they spend money on extravagant things that make them seem important. Vampires suffer from a superiority complex rooted in their infinite potential for life expectancy and supernatural physical qualities. They are almost god-like creatures, and often with that comes the need to be looked at if if they are gods amongst men. This is done in society by being the wealthiest, so therefore Lestat spares no expense in clothing Claudia and decorating the flat. This is similar to the way that royalty would purchase unnecessary luxuries and parade them around. Just think of Marie Antoinette and Louis XVI. While Lestat pursued his material desires for a lavish lifestyle, Louis and Claudia chose a different aspect of French lifestyle to focus on: the arts. Both Louis and Claudia read a good deal, for which Lestat often mocked Louis, calling his library a pile of dust. Louis describes Claudia getting lost in the pictures of a book. They also play the piano, which is a common theme in vampire fiction. I understand it though. If you had all of the time in the world, and had everything you need, why not take that time to learn something as difficult and rewarding as the piano? Another aspect of French culture that fits with, if not aids, the vampire's lifestyle: nightlife. This facet of New Orleans allows the vampire to avoid suspicion by claiming that the night was a wild, drunken affair gone wrong. Likely stemming from the French’s love of wine and food, and tendency to overindulge in the two, nightlife and partying are important aspects of New Orleans culture. Not only is it helpful that an abundance of drunk and susceptible people are out and about during the hours that a vampire might be outside, it provides also provides the perfect cover. This allows for there to be little to no panic around the death, the vampire’s presence is not declared, and he may keep hunting under the radar as he likes. Lestat uses this to his advantage, pretending that the one of the two women he was entertaining had passed out due to overconsumption of wine, so the second was not alerted to the danger she was in. Though we did not explore Bourbon Street at night, we still got a portion of the experience there. Bourbon St. is also a tourist area, and man do people start early. "It's 5 O'Clock somewhere" has been taken too a whole new level. We still explored the city at night, the way a group of underage kids could, well half of us were. We ate, took the streetcar, and explored a city that is as much alive at night as it is in the daytime, maybe even more. 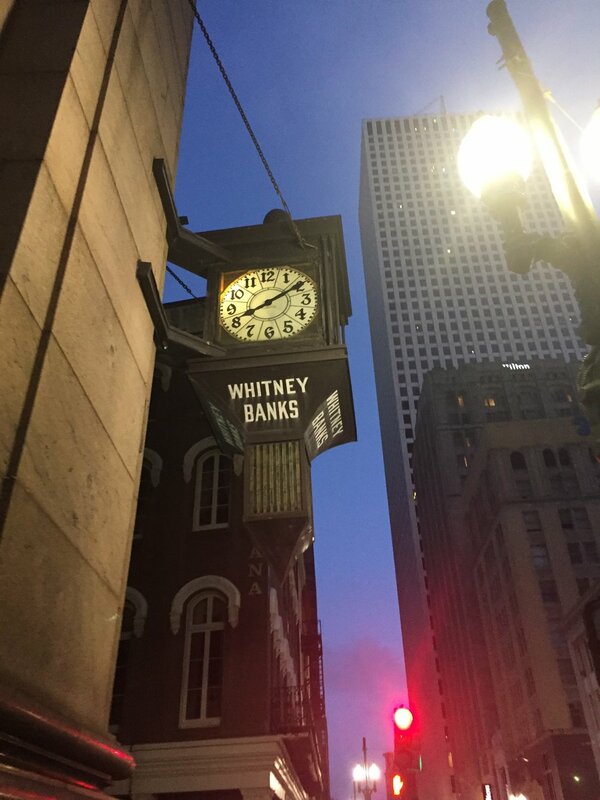 I swear New Orleans should be the city that never sleeps. We would come back at 11pm, but the city was still bustling. I do wonder what Bourbon St. is like at night, and what the inside of all of the mrs and clubs look like, however I am just going to have to wait and come back. The band is great! Right off Bourbon St. Just get there early because the line gets big fast. All over the French Quarter near Bourbon Street. Tours and shops focusing on Vampires and the supernatural. We went into this one close to Preservation Hall. America, France, and Louisiana. All three flags displayed together on the famous Bourbon St. outside of a nice hotel. These old doors were situated next to the entrance gate of Preservation Hall. A gold man and a man in a decked-out Jazz parade like costume talk on the pedestrian Bourbon St.
First time on Bourbon St.
We walked by so many bars and clubs. One was named The Swamp. Ful view of Bourbon St. Bourbon St. was crowded from the moment we turned the corner. Majority with drink in hand. Definitely the tourist paradise. It was cool to see, but as someone in the group pointed out, a little smelly. Though the history and geography of the south creates the ideal setting for supernatural tales, Louisiana is particularly perfect for vampires. The French aspects of Louisiana culture play off common themes surrounding vampires so well. Anne Rice is not the only one who has noticed these qualities of the south, specifically Louisiana. Many other television shows, films, and novels that have paranormal aspects take place in and around Louisiana. Popular culture set in Louisiana with supernatural themes range from the television show True Blood (2008-2014), and its highly sexualized portrayal of vampires, to the children’s movie The Princess and the Frog (2009), where a prince is turned into a frog by an evil voodoo man. French culture seen in this novel are also common themes in vampire fiction across the board today. In movies and books focusing on the popular supernatural beings, vampires often enjoy accumulated wealth from their many years. Nightlife is of course a running theme as well, due to that in most fiction, vampires cannot be in the sun. Bars are often utilized as hunting grounds for the creatures of the night. Voodoo culture is another reason why the supernatural is at home in Louisiana. The popular version of Voodoo is that which is seen in movies and books like The Princess and the Frog. However, we had the chance to learn about the history of Voodoo from the heart. It is a religion, not witchcraft as most people believe, of which I was one. The religion has many aspects, but the biggest is the importance of spirits and appeasing them for good fortune. Since I am not an expert on Voodoo, if you are in New Orleans, you should make your way over to the New Orleans Historic Voodoo Museum. Though the museum is only a few rooms, they are filled with information and displays. You might even make an offing while you are there. Music is an important part of every culture, especially in New Orleans. However, before Jazz took over, classical piano was extremely popular. Mademoiselle Riesz's music in The Awakening shows the importance of music on a personal level as it played a big part in Edna's awakening in Chopin's famous novella. Each key discovers new passion. A single tear rolls down her cheek. In the crowd surrounding, she remains isolate. The only one in the room worth playing for. Our first taste of "bookpacking" took place in Grand Isle, situated off the Gulf Coast of Louisiana, and a popular vacation destination. With only two full days in our rental house, we dove into the The Awakening by Kate Chopin. 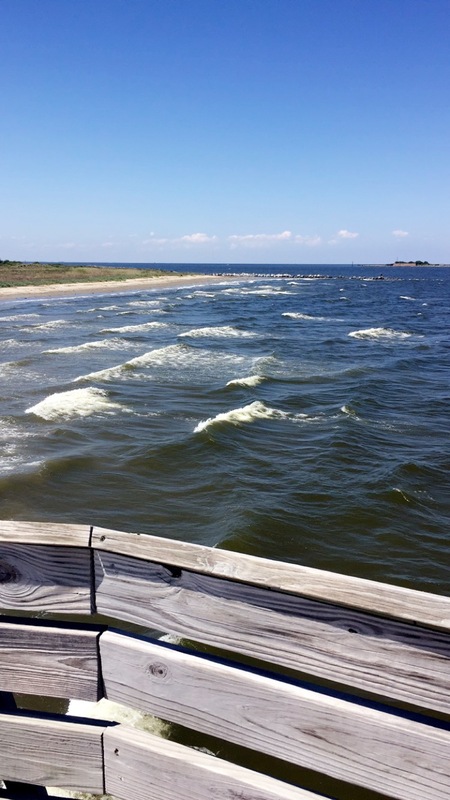 In each place I chose to read: on a rocking chair looking out at the gulf, on the porch swing under the house, and most especially on the hot sand of the beach, Chopin's description's of Grand Isle leapt off the page. 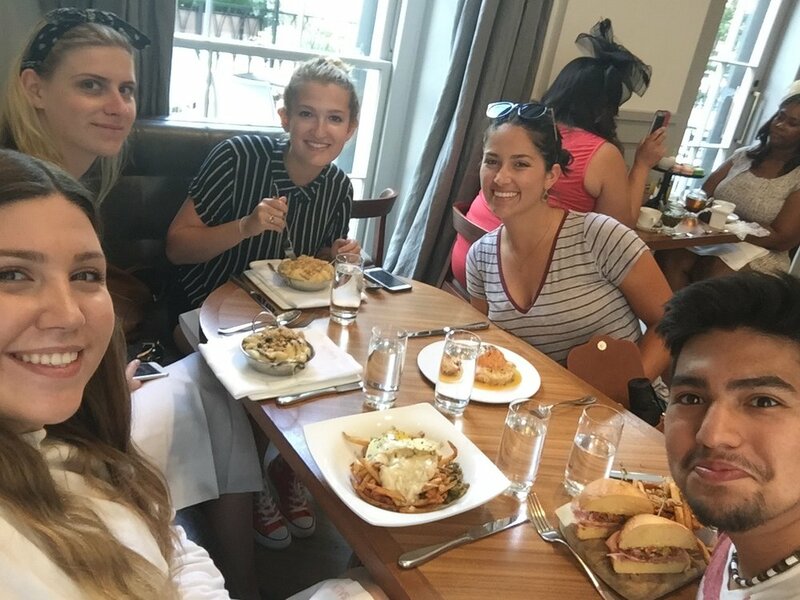 Each day was filled with good food, enticing stories, and wonderful company, but my goodness was it muggy! If there was one description of Grand Isle from The Awakening that I most connect with it would be that of the weather. So hot, so sticky, and so windy. The above quote alone describes the weather for the while of our time on the island. Though she did forget to mention the mosquitoes. The group had multiple conversations about the weather, and remarks about the heat and humidity were not few and far between. The last leg of our drive from the airport to Grand Isle was by far the most beautiful. Though no pictures could due this picturesque view justice, we continually took photos, our noses pressed against the windows of our van. The next day we took time out of the day to explore on the other side of the bridge connecting Grand Isle to the main land. We discovered the most picturesque view was from the pier built parallel to the bridge. Sea life was abundant both in the water and on the pier. Not pictured: abundance of hermit crabs in the shallow water, and the three fish sunbathing at the end of the pier. Our last full day in Grand Isle was beautiful as always, though very windy at the Grand Isle State Park as you can see. We had the fortune of spotting a small pod of dolphins. While locals were fishing off the pier, we enjoyed the breeze and the view of Grand Terre (visible far right), which is plays an important role in the rich history of the pirate, Jean Lafitte. I have had the pleasure of reading The Awakening twice before this experience. Each time I re-read a book I discover something new. With an established familiarity, I am able to read between the lines, dig deeper into the character’s subconscious, and speculate more about the author’s intentions. This third time reading Chopin’s famous work was no different in that respect. However, I believe I was able to take away even more from this read due to my scenery. 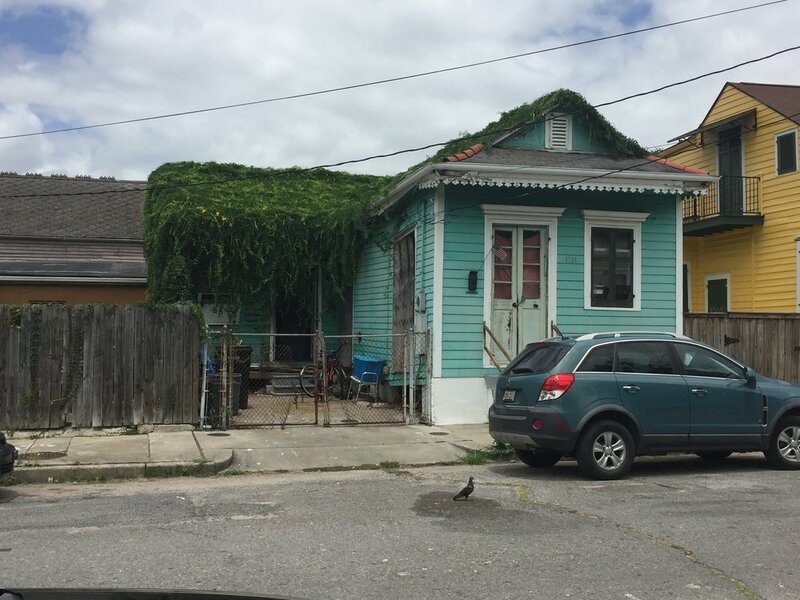 I had a basic view of what Grand Isle, New Orleans, and most major settings looked like, though when we arrived in Grand Isle I discovered that my idea of the place was not quite reality. 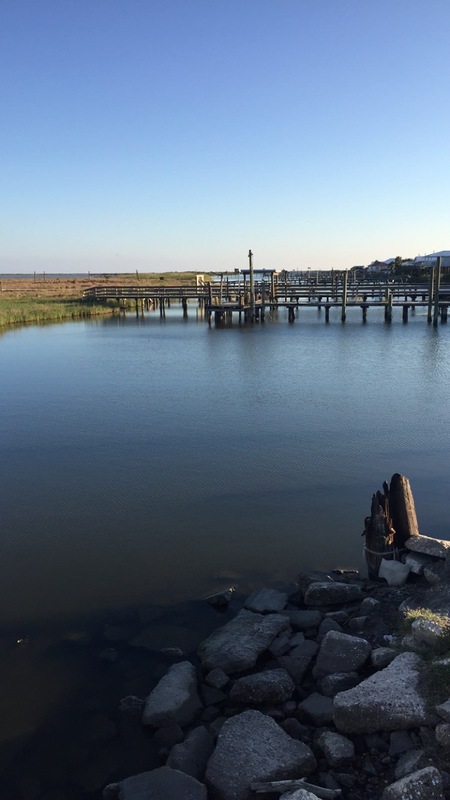 With this newfound realistic view of Grand Isle, I was able to lessen the gap between myself and the story even more. Sitting on the beach I could see Edna. I have no trouble visualizing a scene in a book, in fact that is my favorite part about reading; when a scene floats off the pages and you can visualize it like a movie in your mind. With this experience I did not have to visualize Edna on the beach while I sit in a café but I could sit on that very beach. The experience was almost overwhelming. A story is so much different, more exciting, and more relevant when the reader feels as if they are a part of it all. That is what the idea of “bookpacking” has done for me. With each new look at this wonderful text I am able to discover something new and interesting, but reading it in the setting where a large part of the novella takes place granted me not only new insight, but a new experience. A multidimensional experience. And so on we went, ready to tackle the next leg of our journey. Driving north on our way to New Orleans, stopping along the way at the Jean Lafitte National Historical Preserve, exploring the bayou in hopes of spotting an alligator. Though unfortunately we had no such luck, we were able to see a few colorful dragonflies and even a lizard. The Spanish moss hanging on the trees added an eerie beauty to the walk which is something that I am not lucky enough to have seen before as a born and raised Midwesterner. in short, my first few days in Louisiana were magical. Eerie beauty of the Spanish moss.